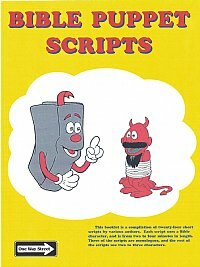 Twenty-four short scripts by various authors. Each script uses a character that is a Bible, and is two to four minutes in length. Three of the scripts are monologues, and the rest of the scripts use two to three characters. Topics include neglecting God's Word, and exciting stories in the Bible. Bible puppet is available separately. click on picture for link.